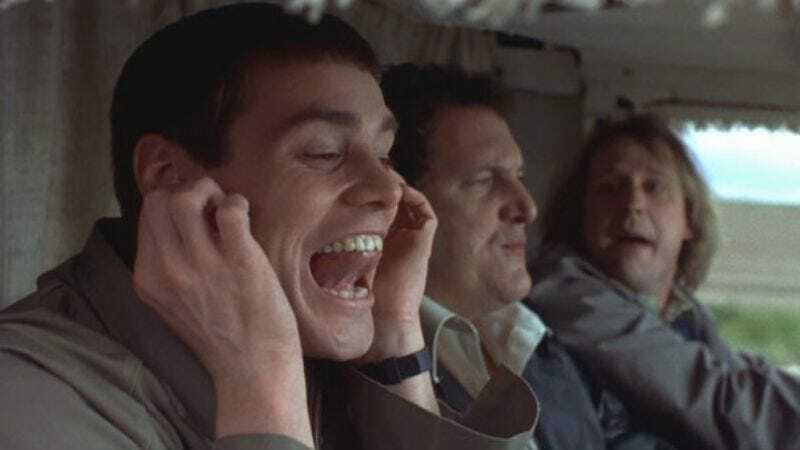 While it was just last month that Universal picked up Dumb And Dumber To, thus telling you there’s a chance, the existence of said chance is now being complicated by a pair of lawsuits that we’re also telling you about. The sequel’s new financiers at Red Granite, Riza Aziz and Joey McFarland, recently filed suit to exclude Dumb And Dumber producers Brad Krevoy and Steve Stabler from the follow-up, despite Krevoy and Stabler’s claims that their original New Line contract grants them the right to be involved with any remake or sequel. (Indeed, they are among the few who will proudly admit to have been involved with Dumb And Dumberer: When Harry Met Lloyd.) Now Krevoy and Stabler have filed their own suit that calls into question Aziz and McFarland’s professionalism—a counterclaim that threatens to sully the Dumb And Dumber franchise with stories of petty, juvenile behavior. “McFarland's and Aziz's experience producing motion pictures during their short tenure in the industry consists of cavorting at nightclubs with Paris Hilton and making dinner reservations at posh nightclubs in New York and Los Angeles,” these actual legal papers filed in a courtroom, and not submitted to a particularly nasty showbiz blog, say. In addition to intimating that there’s something to the movie business besides eating dinner at posh nightclubs—and that “cavorting” with Paris Hilton somehow doesn’t give one the necessary experience to make a Dumb And Dumber movie—the countersuit alleges that Red Granite tried pulling this same shady maneuvering on Martin Scorsese’s The Wolf Of Wall Street, adding that these latest actions “put in doubt” whether they’ll honor their contracts with anyone involved with Dumb And Dumber To, or any movie they work on hereafter. "Let the record show that they are also total buttfish," the suit does not say, regrettably, because that would be like in the movie. Anyway, Krevoy and Stabler are currently seeking monetary damages, which at the very least should go a long way to helping them get into those posh nightclubs they’re obviously after. Maybe Paris Hilton will be there, cavorting!